It is woodworking. The processing accuracy is 0.0 mm. It is usable without a problem, but the point is that the display of the scale is thin and the point is that it is a drawback. This review is about item#21271653. A closer look at what arrived at me showed that there was a slight deviation between the zero scale and the vernier line. As we became anxious, we borrowed a micrometer to a mechanical craftsman and compared measured values at 4 points of 25, 50, 75, 100 mm. As a result, the measured value came out 0.02 mm larger at each point. (Vernier can only read to 0.05 mm, but it was judged by two eyes.) In the opinion of the craftsman, it is also recommended that those who work precision work to buy JIS 1 grade products. On the other hand, if you do not make severe measurements there, you will be able to withstand use sufficiently, and it may be easy to buy because the price is low. Since my application is the latter, I use it without hesitation. It's cheap anyhow. Cost performance is very good. It is sharp enough to think that if the edge part of the metal touches the finger it will cut the skin, but is it the way it is a product that requires precision? It is a level that you do not mind such as error. It is user-friendly. Letter size. The amount of slide is just right. I purchased it for company because it used to be broken. Site talks · · ·. It seems easy to use. . . This review is about item#21271662. 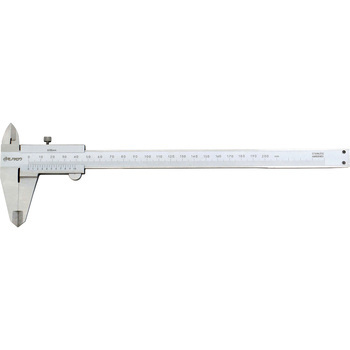 I was considering buying a vernier caliper which was a measuring tool from before Finally I was able to purchase it. There is no problem with standard use at all. I will pay attention to the management side and I would like to use it forever for a long time. Especially it can be used without inconveniences comparing with those made by manufacturers. I am satisfied with my own use. Feeling, texture is also good with moderate weights are very easy to use. I am recommending it because it also comes with a luxurious case. Because there is no problem in terms of performance at the balance with cost, there is considerable sense of affinity. This review is about item#21271678. It seems to be a copy of Mitutoyo but coarse making. However, I think that it is a level that can be used enough if we consider the price. Measurement of inner diameter, outer diameter, etc. Until now, we have measured roughly with major, but we had to measure it exactly, so I bought it. It is handy indeed. Regarding accuracy, there is no problem in my use This evaluation because there was not one screw stopping the depth bar. I purchased a precision screw at Homsen and treated first. We are sending promptly and are very helpful and purchasing every year. Easy to handle about operability, the size is reasonable, so you can use it even after training. Also, since the case is solid, I think that it was easy to store and to have found a good product. The thing which I used until now is broken and I bought it, the price is cheap and I am satisfied with the same as a maker's item. I bought it for use in one overseas country where the digital one is always considered accurate. The surface treatment was satisfactory, and there were no difficulties in slippage due to Bali etc. as was the case with several reviewers. Vernier responded up to 0.05, this was the purpose and 100% satisfactory product. However, the situation when sand / dust enters may be seen as future use. It has enough functions just to measure less than 1 mm without batteries. I bought it because it was cheaper than other companies' products, but it has been successfully used. It is regrettable that the scale is difficult to see a little. It was better than the price. As I mentioned in other reviews, I was worried about Bali for a while There is no problem if you pick it up. There is no play, etc.